San Jose America Festival at Guadalupe River Park’s Discovery Meadow. Enjoy international music, multicultural crafts and a variety of ethnic and festival foods. Activities for children are in Kidland. Performances all day Friday at the Main Stage and the Blues Stage. There are also concerts Saturday and Sunday that include Night Ranger, Starship, Amanda Miguel and Diego Verdaguer. Pancake Breakfast at 8 am, followed by games and entertainment throughout the day including a carnival area, petting zoo, face painting, and swimming at the International Swim Center. Bring a picnic lunch or purchase foods at the event. Pancake Breakfast, 5-K Run & 1 Mile Walk, Historic 4th of July Parade, Downtown Family Festival, Live Entertainment & Car Show. Beginning 7:00 am. Activities will include entertainers, arts & crafts, free sailboat rides, free dragon boat rides, a giant slide, art projects, face painting and massages; beginning 12:00 pm at the Berkeley Marina. Fireworks, end of the Berkeley Pier at 9:30 pm. There is valet bicycle parking free of charge near Adventure Playground! We went to Oregon last weekend. On the way up, we saw the lightning storm and on the way back we had to drive through the fire. Could barely see what was ahead of us, the visibility was so poor.We have a filter going on inside our apartment and keep all the windows closed. If I spend too much time outside, I start coughing and my eyes get really itchy. According to some of the news reports I’ve been hearing on the radio, I’m not the only one. Heard that there was going to be more dry lightning storms over the next few days so be prepared! Oh, and the lake at Mount Shasta is drying out. It’s such a depressing sight. 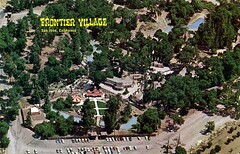 Remembering Frontier Village has gathered at its old site, now Edenvale Park, to reminisce about the amusement park with a summer picnic the past seven years. This year’s picnic is this Saturday, June 28 beginning at 11:00 am. There will be booths set up with various memorabilia, past employees will be on hand to reminisce, the Frontier Village gun fighters re-enact their old gun fighting show, a guided tour of the park pointing out where all the old attractions once stood, along with other activities. Scheduled for this year’s picnic are four of the original Antique Autos; one of them will be available for free rides. There are plenty of tables, chairs, and barbeque grills. The Sixth Annual Jazz on the Plazz is a midweek concert series featuring local, national, and world-renowned jazz artists. Beginning this Wednesday, June 25 and every Wednesday through August 27, this free concert is presented at the Los Gatos Town Plaza, located at the intersection of W. Main Street and N. Santa Cruz Avenue. The series kicks off with a performance by Claire Martin, an acclaimed jazz vocalist from England. She recently released her 12th album, He Never Mentioned Love. Check the Jazz on the Plazz website for a schedule of upcoming artists in the series. Pack a picnic dinner (you may also bring beer or wine) and bring lawn chairs, blankets, and/or folding tables. Get there early to park nearby and to get a good place to sit. Parking is available in the area. For more information, including artist profiles, schedule, seating and alcohol policies, check here. 9-1-1 for Kids is a website packed with information covering emergencies and calling 9-1-1. The information is directed towards children but has many helpful and useful tips for teens, adults, and seniors. Information on the site includes what 9-1-1 is all about, how to dial 9-1-1 from landlines, pay phones, and wireless, and what to say when reaching the dispatcher. I think what to say to the 9-1-1 dispatcher is crucial; in many emergencies time is of the utmost importance. There is a fun video for kids to watch on the site, The Great 9-1-1 Adventure, teaching them the proper use of 9-1-1. Your child may have been presented with this information at school; however, reinforcing the importance of what to do in an emergency may be helpful when a child is placed in a stressful situation. 9-1-1 for Kids is through the collaborative efforts of the San Jose Police Department, the California chapter of the National Emergency Numbers Association (CalNENA), the State of California 9-1-1 Program Office, the Texas State 9-1-1 Commission, corporate and individual donors, and children’s entertainment professionals. This Thursday, June 19, transit will be free all day on Bay Area bus and light rail systems, and until 12 noon on BART, trains, and ferries. The region’s 30 transit systems including BART, Caltrain, the ACE train, Dumbarton Express, SamTrans, along with VTA light rail and buses will participate. This is the last free ride since “Spare the Air” day began in 2004. Last summer there were two “Spare the Air” days that cost $4.6 million. With a lack of federal funding the two government agencies, the Bay Area Air Quality Management District and the Metropolitan Transportation Commission, have determined that the money could be better spent in long-term projects other than reducing emissions for only a few days. “Spare the Air “ will become “Spare the Air Every Day” and will urge the public to reduce energy use every day.